Right from the beginning the couple was interested in doing a classy and vintage shoot with real touch of history. 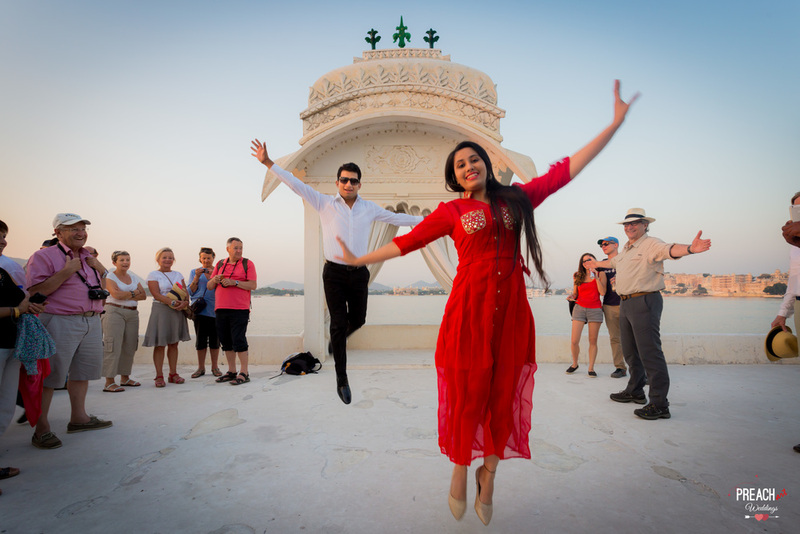 Udaipur definitely became their instant choice and we decided to go ahead and explore the city. 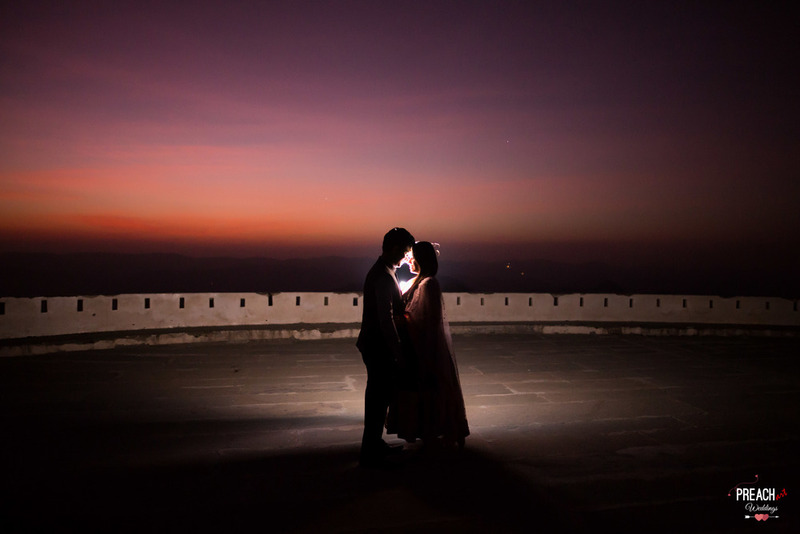 Shot over three days in Udaipur, this couple shoot really turned out to be one of its kind as rather than shooting in just one or two big properties, we decided to venture out into the city, palaces, havelis and the lakes. From driving in a 1963 convertible Standard Herald Vintage car to riding in a private boat at lake Pichola, from the palace in middle of the lake (Jagmandir, Lake Pichola) to the palace on top of the hill (Sajjangarh Monsoon palace), from early sunrises in the lake to sunsets in the hills, we did it all for the shoot! The couple were very fun loving and full of love. It was actually one of their first outing together and so they had such a memorable time in the city being with each other. 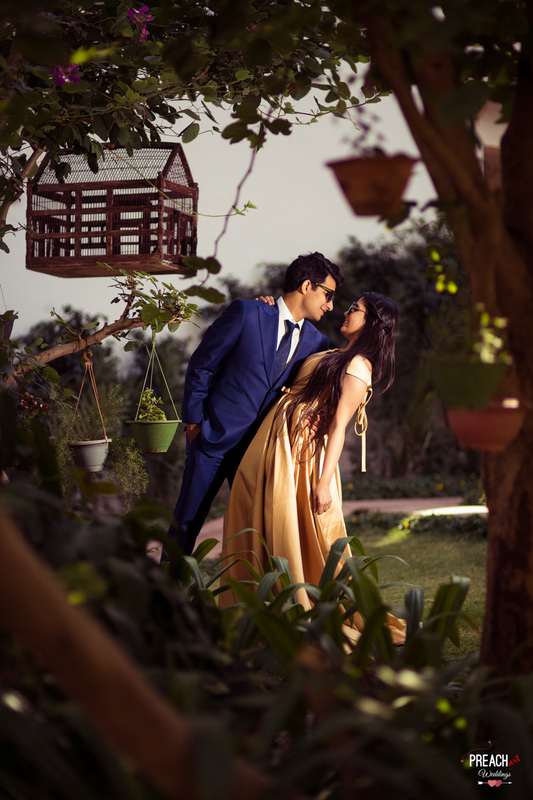 The couple’s love and chemistry was so good that this whole shoot turned out to be an amazing one with loads of beautiful photographs! 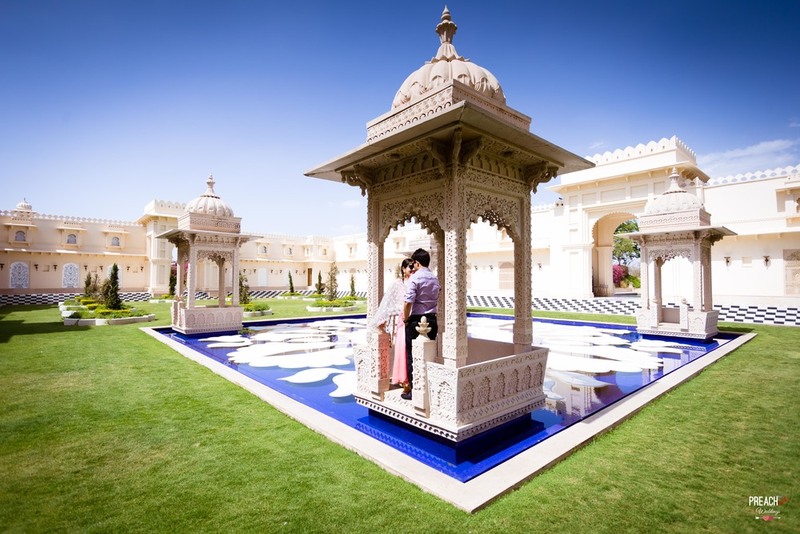 Located in the middle of lake Pichola, this Palace turned hotel offered an amazing backdrop for the evening shoot. The couple grabbed quite of lot of attention from the foreign tourists who just couldn’t get over clicking the lovely duo. And we got our opportunity to try some quirky shots with the crowd! For the next day we planned something special, we had arranged a vintage car, the convertible red colored Standard Herald 1963. 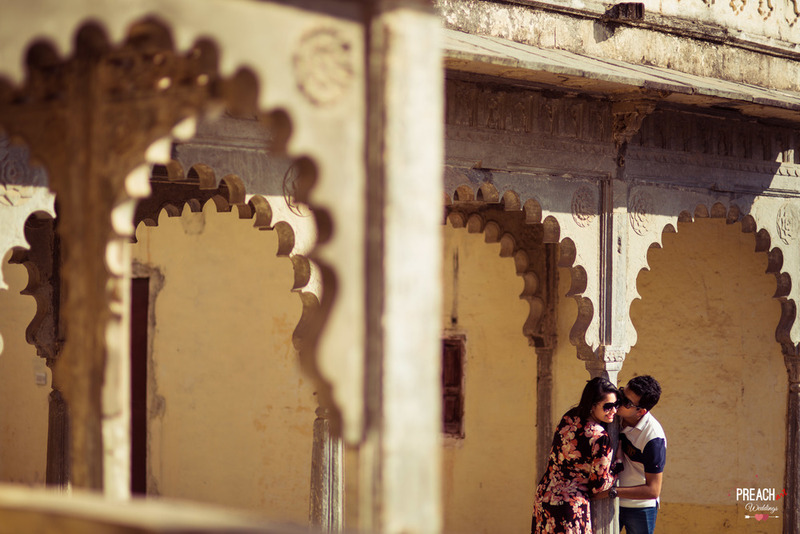 The couple was all dressed up for the vintage shoot on the streets of old Udaipur. We started early morning to avoid the traffic but still it turned out to be a challenge. 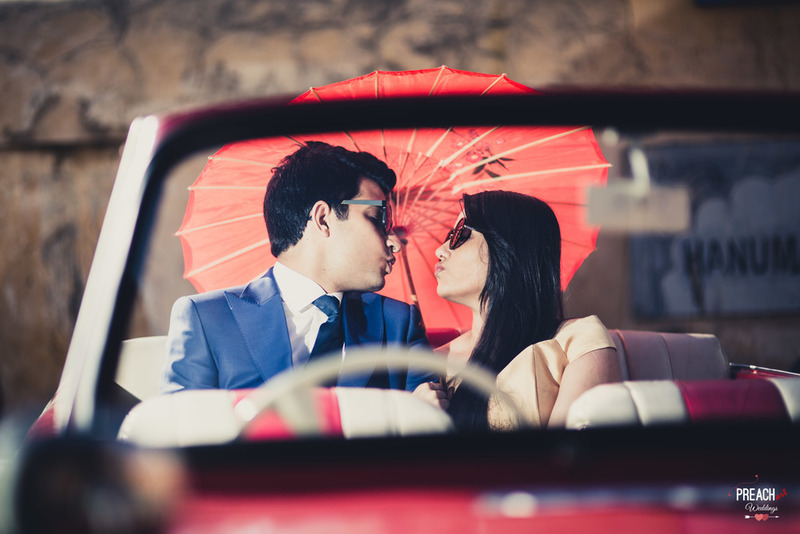 Firstly the traffic, secondly all the attraction we gathered with our lovely couple dressed up and riding in this beautiful vintage car. But obviously we did manage to pull off some really classy shots of the couple with the vintage car. And not to forget the ride was awesome! Gangore Ghat is located on the banks of Lake Pichola with an awesome view of Lake Palace. The best part about this location is that it is also a pigeon-feeding place and so we got to take some beautiful shots of the couple with pigeon flying all around. 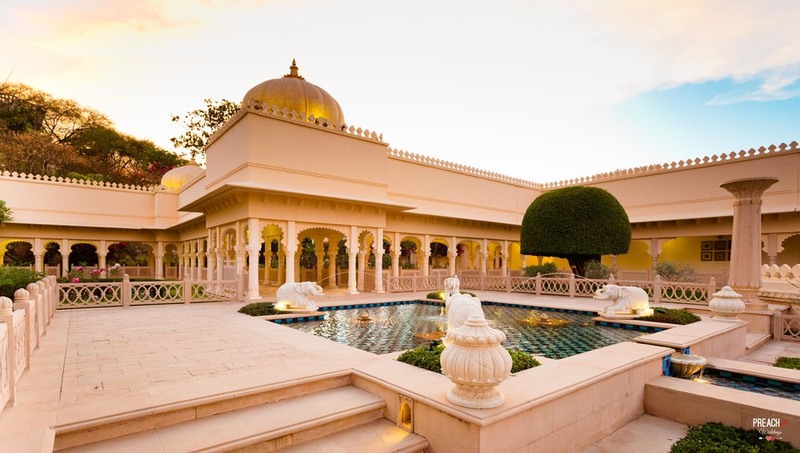 Bagore ki Haveli, is located right next to Gangore Ghats. This old haveli has recently been restored and is actually a museum with not too many people around. Lovely courtyards, chatris, and a great view to the Lake Pichola, altogether contributed to some wonderful shots. 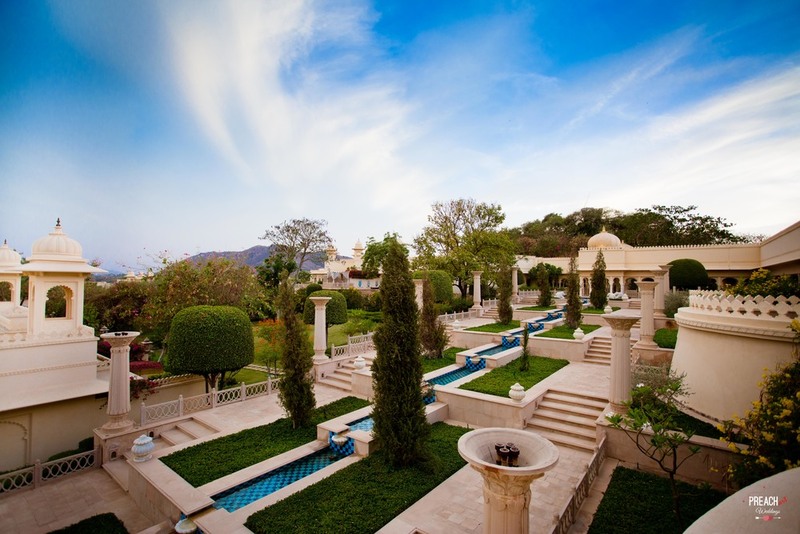 Sajjangarh palace is a hilltop palatial residence, overlooking the Fatehsagar Lake. Its one of the best Sunset points in Udaipur. As expected, it was too crowded but we tried vacating a few frames. Right after the sunset people started to leave and so by the time, when we still have those beautiful colors in the sky, we had the palace all-empty for us. And got a great opportunity to try some flash photography, the result was heavenly. 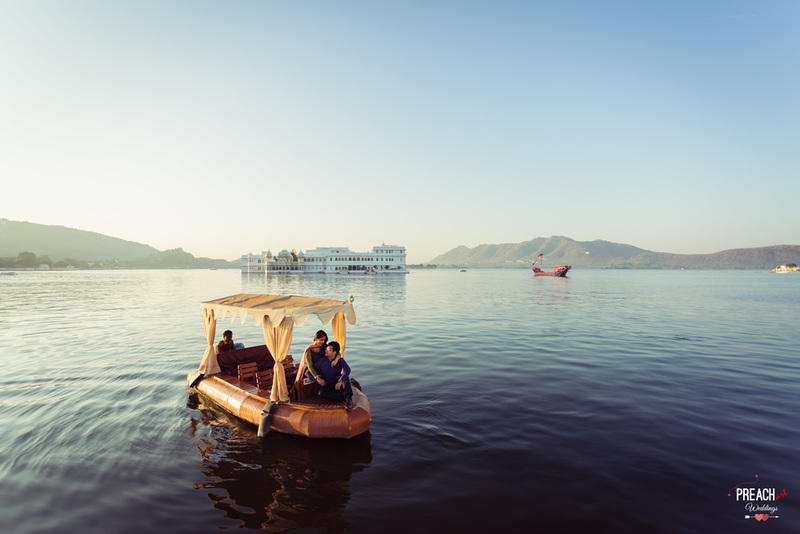 The next morning we planned to take few clicks at the Lake Pichola and had rented a private boat for the morning. For sometime we were off the boat with couple sailing around and us taking clicks from the banks of Lal ghat and Amrai Ghat. With a little bit of coordinating on phone with the couple and asking the rider to move back and forth we eventually managed to get some serene shots of the couple with magnificent landscape of Lake Pichola. The couple had some time to spare while staying in Udaivilas post wedding and we did a very quick couple shoot at the property.